Written by Band Boosters on March 11th, 2019 March 11th, 2019 . 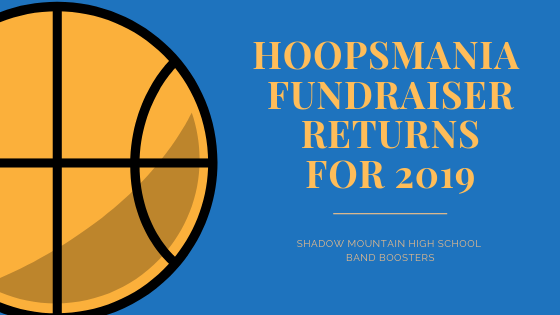 This year we will once again be selling ‘HoopsMania’ tickets as a fundraiser for the band. This is a fun and easy way to raise money, and we had great success with it last year. Important note: Selling tickets on the SMHS campus or at any PVUSD property is prohibited. How it works: Band parents sell tickets for $20 each to friends, family members, acquaintances, etc. Each ticket includes a code to access the associated downloadable music. Each ticket also includes a complimentary sweepstakes game card. 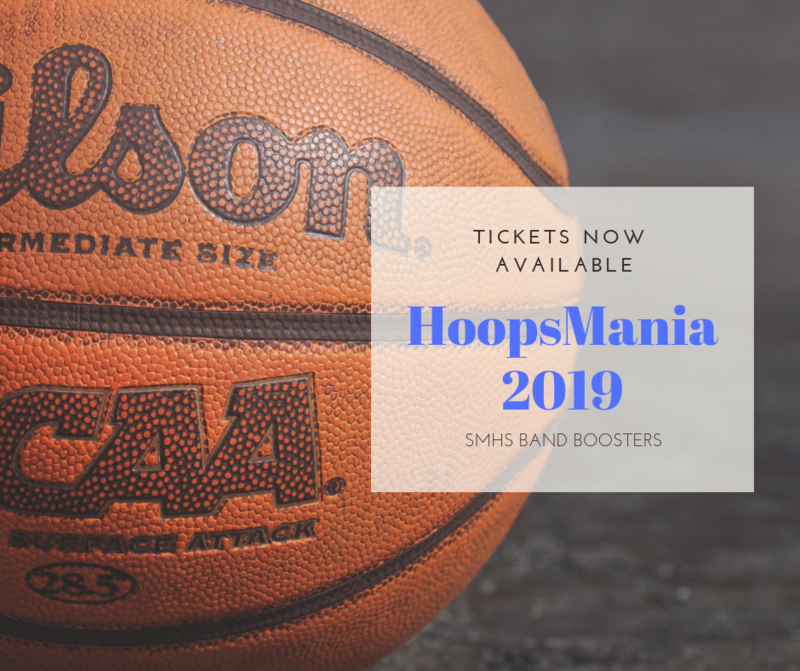 HoopsMania is an exciting sweepstakes fundraiser based on college basketball’s national championship tournament in March. Each HoopsMania game card contains 8 random college basketball teams that will play in the tournament (you get 2 teams from each region). All cards have seeds 1 through 8 printed on them so everyone has an equal chance of winning. Once the teams are announced you can write in the team names! During the basketball tournament, you simply add up the points scored by the teams printed on your game card, or go to the designated website to check your cards. Prizes are awarded to the 70 game cards whose teams score the most total combined points throughout the tournament. Prizes range from $30 to a top prize of $1,000. In addition, the 5 cards with the lowest total points scored also win! There are 75 chances to win a prize and 1,440 unique tickets, each of which has an equal 1 in 19 chance to win a prize! In addition, every week there will always be a winner among those who bought one of our tickets. You can sell paper tickets. Contact Tom Cadden to obtain the tickets (his email will be in the Band Happenings Newsletter). Let Tom know how many tickets you’ll need and arrange a time to pick them up from him. When you sell a ticket, please keep the stub and return it along with the money to Tom or put it in the grey drop box in the band room. There is no charge for unsold tickets, but we ask that you return them to Tom. People can pay for paper tickets either with cash or with a check made out to SMHS Band Boosters. Direct people to buy online with a credit card on a secure website (http://www.charitymania.com/give/y9076). You can send this link out to your friends and relatives via email or Facebook. Tickets and money must be turned in to Tom by Tuesday, March 19th so tickets can be activated for the full tournament. Tickets can be sold or purchased after March 19th, but the buyer would only be able to play for the remaining weeks in the season from the time purchased. NOTE: March 19th is during Spring Break so you will not have access to the school to drop of any money/tickets; please contact Tom directly! Remember, this is an easy way to help defray costs for the band. The band receives $14 for each $20 ticket sold. If 60 band families sold (or bought for themselves) just one ticket each, the band would clear $800! Think how much more we can make if everyone can sell just a few tickets! Read the article It’s HoopsMania Time! Get Your Tickets Today! Written by Band Boosters on February 23rd, 2019 March 29th, 2019 . Written by Band Boosters on October 22nd, 2018 October 22nd, 2018 . Written by Band Boosters on October 3rd, 2018 March 12th, 2019 . Written by Band Boosters on August 26th, 2018 August 26th, 2018 . Written by Band Boosters on August 12th, 2018 August 12th, 2018 . Written by Band Boosters on August 7th, 2018 August 12th, 2018 . Written by Band Boosters on July 24th, 2018 .